Click here to view DICOM images. Viewer courtesy of Claron Technologies. A 66-year-old woman presented to the emergency department (ED) with a history of a fall and trauma to the knee. 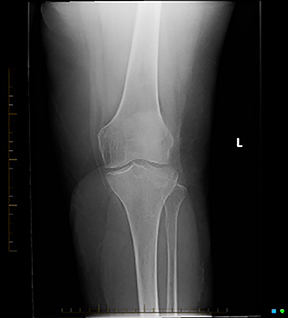 The first evaluation she underwent was a radiographic evaluation of the knee with standard AP, oblique and lateral views, which showed a joint effusion and a deformity of the lateral tibial plateau, suspicious for a fracture (Figure 1). We need to point out that at the time tomosynthesis was not available for clinical use, but only through an Institutional Review Board-approved research protocol aimed at evaluating and comparing it with computed tomography (CT) and magnetic resonance imaging (MRI). 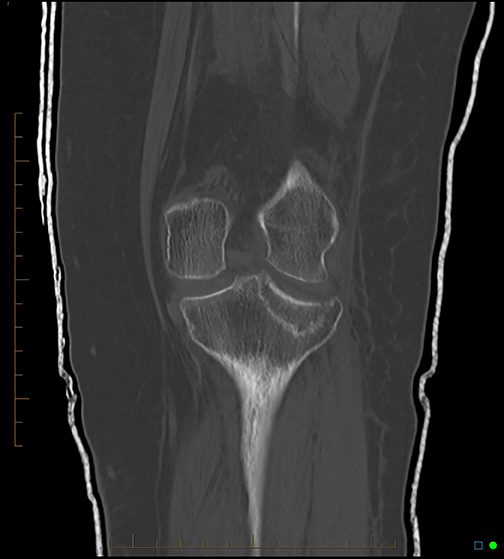 The patient then underwent further evaluation of the left-knee deformity by means of both a CT scan and about 36 hours later with tomosynthesis. Tomosynthesis was acquired in the AP plane only, which was felt to be sufficient at the time to evaluate the degree of anatomic deformity and the degree of displacement of the fracture fragments. What you can appreciate on the tomosynthesis images (Figure 2), reconstructed at a 1-mm interval, is that the fracture line is markedly more complex than you can appreciate on the standard AP and lateral radiographs. This is a comminuted fracture, with extension of the fracture line toward the tibial spine, and there is a mild degree of fragment impaction in the laterial tibial plateau. The other important contribution of tomosynthesis is represented by the fact that there is an accurate and confident exclusion of further extension of the fracture line to medial tibial plateau, as well as exclusion of other fractures associated with this injury. Mildly comminuted fracture of the lateral tibial plateau extending to the intercondynal eminence with mild depression of the main fragment. There are several clinically relevant questions that imaging is asked to address in the presence of a complex injury such as this one. The first one is to have an accurate spatial assessment of the fracture itself, ie, is it simple or comminuted, and is there a degree of displacement of the fragment that may require complex surgical intervention to reconstruct the normal anatomic articular plane of the knee. Tomosynthesis shows detailed skeletal anatomy analogous to what is seen with CT. The multiple fragments characterizing comminution, the small degree of depression of the main fragment, are all well appreciated on both the tomosynthesis as well as on the CT (Figure 3). Other important information that is typically asked of us by the orthopedic surgeons is whether there is the presence of any other injuries, such as additional fractures, that would need to be addressed at the time of definitive treatment. We can confidently exclude other skeletal injuries with tomosynthesis, as also confirmed by the CT. There are no extensions of the fracture to the medial tibial plateau nor any fractures of the proximal tibial metaphysis, the fibula, or the distal femur. Tomosynthesis reliably excluded the presence of intraarticular fragments, which may cause severe cartilage damage, as well as underlying destructive lesions that could be the cause of the fracture or jeopardize surgical repair. 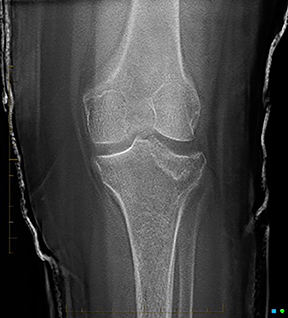 In our patient, tomosynthesis, in addition to confirming the fracture diagnosis already put forth by the plain radiographs, provided a better anatomic assessment of the fracture itself, documented the degree of fracture comminution, displacement of the fragments, and the degree of anatomic deformity. Today, the standard of care requires CT to answer these questions. Our case in fact suggests that these answers can be provided with a high degree of reproducibility by tomosynthesis, as far as osseous structures are concerned. We see the same number of fragments, the same extension to the intercondylar eminence of the fracture line, and we appreciate the same degree of depression of the lateral tibial plateau fragment. However, tomosynthesis is unlikely to replace CT as far as contrast and spatial resolution for associated injuries to the soft tissues. Tomosynthesis provides similar anatomic detail to the CT pertaining to the skeletal deformity for a traumatic injury at a fraction of the dose to the patient and probably, this will have to be determined in the near future, at a fraction of the cost. Body Tomosynthesis Offers Low-Dose Alternative to CT. Appl Radiol. Dr. Bova is a Professor of Radiology, Stritch School of Medicine, Loyola University Chicago, and Medical Director of Diagnostic Radiology, Loyola University Medical Center, Chicago, IL.